Jacques Pepin Peas: I'm Kinda Obsessed. Last week on the Bravo reality show, Top Chef, the chef-testants were challenged to create the 'last meal' as requested by famous culinary stars such as Lidia Bastianich, Wylie Dufresne and Jacques Pepin. Jacques requested a simple dish of Squab and peas. Chef-testant Carla did a superb job of creating the dish. And for the peas she chose to hand pluck fresh peas, add some butter, salt and pepper. Just how Jacques likes it. Bravotv.com asked: The whole theme of this episode revolved around "the last meal." You chose squab and peas. What does that dish mean to you? Jacques: I had a hard time there because I would, of course, want my last meal to be very, very, very long with all the food that I like. When I was a kid the squab was one of the special treats that we would get occasionally throughout the year. The fresh peas, for me, is really a celebration of spring and is very appealing to me. Carla did that very, very well. I remember the peas more than the squab actually. They were really fantastic. 1 bag of organic frozen petite peas. My favorite brand is Columbia River Organics (I found them at Whole Foods). MAKE: Poke a hole in bag. Microwave for 4-5 minutes. Allow steam to puff up bag. 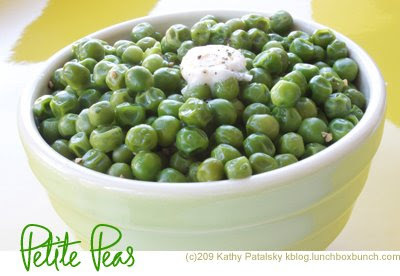 Toss peas with butter and salt and pepper to taste. Peas are a very good source of protein, B vitamins, magnesium, phosphorus, manganese, iron, potassium and vitamins K, C and A.